The dB Blocker™ Grip is similar in design to the Classic except instead of a wire anchor, Grip has a polycarbonate tab to facilitate insertion and removal by those with larger or dirty hands. The dB Blocker™ Grip has a Lanyard (detachable cord) can be removed from the tab where contact with machinery in motion can be a safety issue.The detachable cord increases safety and is suggested for areas where moving machinery is a concern. Particularly suited for workers in heavy soiled industries, the pull tab maximizes hygiene as the wearer does not have to touch any part of the protectors. dB Blocker™ Grip is a hearing protector that is actually comfortable to wear. Most hearing damage arises when an ear plug is removed for conversation and comfort. The dB Blocker™ Grip is made to fit the individual’s ear exactly and stay in place without pressuring the ear so comfort is not an issue. 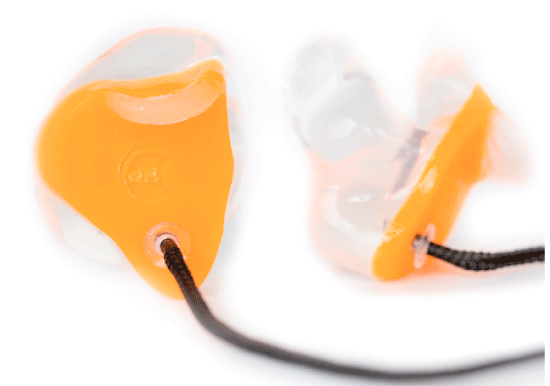 This gives the worker a product that provides effective hearing protection and stays in the ear all day long. The Non-Vented dB Blocker™ Grip hearing protector (earplug) was designed for persons who work in and out of noise, or do not need to communicate while in noisy environments. They are ideal for executives and supervisors who visit the factory floor infrequently and do not need to communicate while in a noisy workplace. Less noise induced stress leading to fewer accidents and less absenteeism. A hearing protector that is comfortable to wear will enhance compliance with your hearing protection program. The RCPT™ gives each worker the same amount of hearing protection because it is custom fit. Coloured exterior makes them easier to find if dropped and allows managers to see if employees are wearing them at a glance around the plant floor. The protectors can be made detectible by a metal detector.